Autumn is not always blessed with the best weather conditions, and October can be a bit of a dismal, dark and dank month. However, Halloween at the end of the month means that there are lots of opportunities to keep the kids entertained with some good-old fashioned spookiness during the upcoming half-term. The celebration provides lots of opportunities for dressing up, party games, themed food and drink and ghoulish decorations to set the spooky atmosphere. 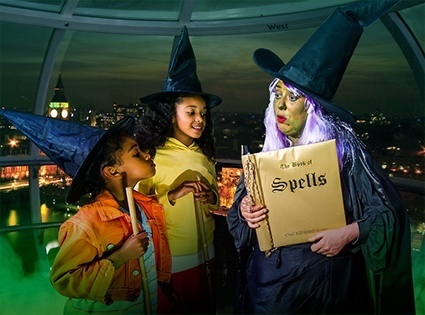 A combination of Halloween and Harry Potter is bound to please all the family, as there are special events happening over the half term holiday in addition to the usual attractions to be enjoyed. To celebrate the launch of the new permanent Dark Arts section, they are also offering extra Dark Arts activities throughout the October half-term. A section of the Halloween feast from Harry Potter and the Philosopher’s Stone will be on display in the Great Hall of Hogwarts. 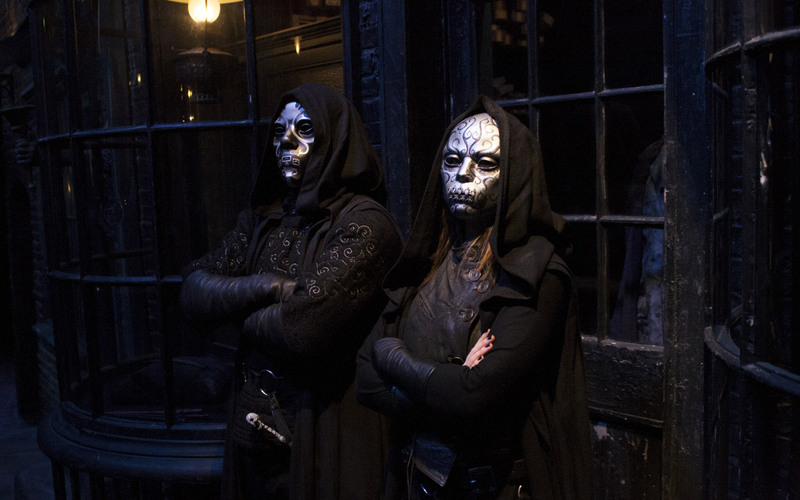 The infamous Diagon Alley takes on an even more sinister ambience as the lights are dimmed and a clutch of scarily-masked Death Eaters patrol the shopping street. You can opt to take part in an interactive wand combat lesson to practice your duelling techniques, should the death eaters get a bit too close for comfort! Alton Towers is a great theme park for family fun, with thrill rides like ‘The Smiler’ and ‘Thirteen’, family rides and attractions as well – Cbeebies Land opened earlier in the year – with lots of fun for younger visitors. Highlights include ‘Justin’s House Pie-O-Matic Factory’, ‘In the Night Garden Magical Boat Ride’ and ‘Get Set Go Tree Top Adventure’. For those that want more chills and thrills, and this is all a bit tame, there’s lots of Halloween fun to be enjoyed from 18th October to 2nd November when Scarefest will be running. The park will be open each day from 10am till 9pm and younger visitor can enjoy live Halloween shows and Character Meet and Greets. For hardier souls (recommended age 14 and over) there is the Scare Maze, Terror of the Towers, Zombies Scare Zone and Scary Tales Scare Zone. Hauntingly good fun! 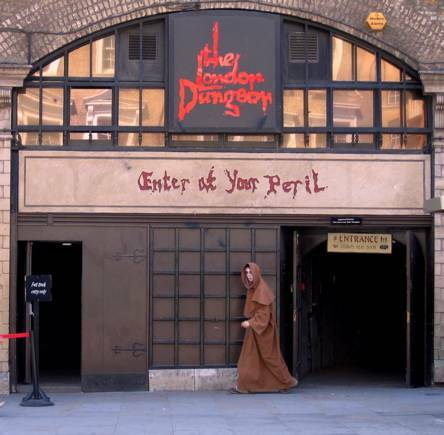 The Dungeons are a combination of Halloween and Hell at the best of times, so they only get an awful lot scarier when it is actually Halloween! The costumed characters of Sweeney Todd, his ‘pumpkin’ pie making sidekick Mrs Lovett, Jack the Ripper, Guy Fawkes and Henry VIII will all be lurking in the shadows, and they are also joined by a new character to get the visitor’s pulse racing. The Master of Tricks will be bamboozling guests with his wit and games of deception and handing out Trick or Treat cards to visitors to see whether you will get a nice surprise or a not-so-nice one! Halloween is the perfect time to take a murky meander through the dingy streets of London and take a look at the dark underbelly of 1000 years of history of our capital. Take in the horrific sights, sounds – and even smells (!) of the past and make your Halloween truly horrific. Not for the faint-hearted, this is more suited to teenagers and adults. An English Heritage castle with dingy dungeons, hidden corridors and underground tunnels is the perfect venue for those that love history as well as some haunting thrown in for good measure. They have a range of events at their different properties throughout the country so you can take your pick to what you fancy doing. 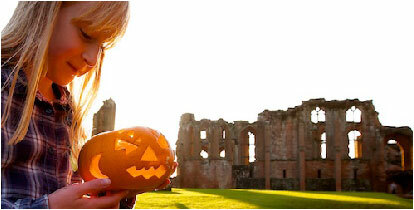 Some of them are extending their opening times till after dark, there are ghost tours for older visitors, pumpkin carving and other spooky craft activities for younger history buffs. You’re spoilt for choice when you look on their website for events near you. Lots of these ancient properties are reputedly haunted in real-life, not just at Halloween, so keep your eye out for some real spooks as well as those in fancy dress! Whatever you have planned for Half-Term and Halloween, we hope you enjoy all the fun of the season, and don’t forget the Bonfire Nights that will no-doubt be happening too – to really make your family time go with a whizz and a bang!